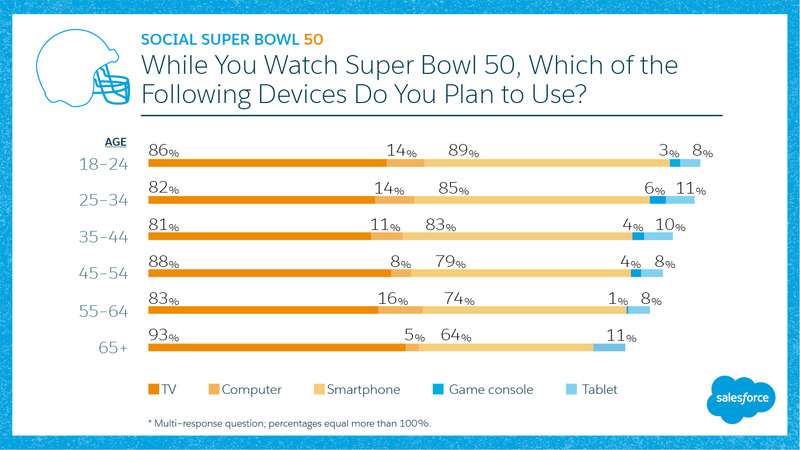 Approximately 73 per cent of viewers plan to use two screen-based devices during Super Bowl 50 on Sunday, with a nearly equal number planning to use smartphones and televisions and an additional seven per cent planning to use three devices or more, according to the experts at San Francisco-based CRM firm Salesforce.com. “This is good news for marketers whose budgets aren’t super-sized because they can still make an impact on almost as many consumers without spending millions of dollars on a TV advertisement,” Heike Young, a digital marketer with Salesforce, wrote in a Feb. 4 blog post. 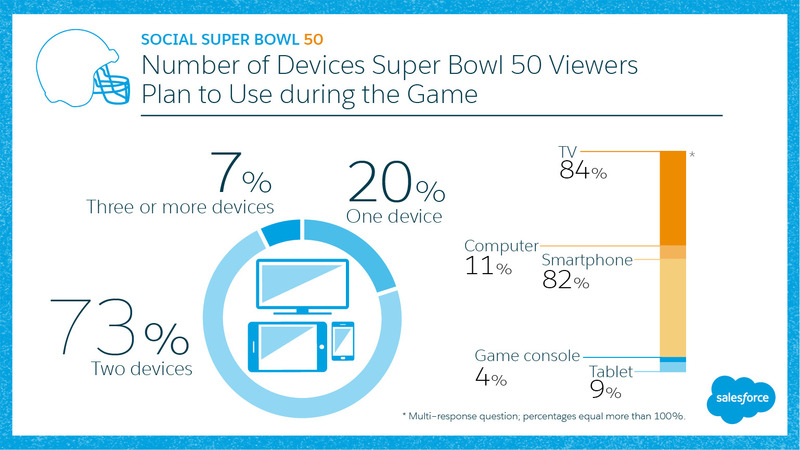 Basing its data on interviews with 1082 consumers, which it divided into six age groups, Salesforce discovered that 89 per cent of viewers between 18 and 24 planned to use a smartphone during the game, versus 86 per cent who said they would use a TV – meaning three per cent of younger viewers will be enjoying the game without a TV, Young wrote. And if you think the Super Bowl only matters to U.S. advertisers, think again: last year’s broadcast drew more than 9 million viewers in Canada – which actually means a higher percentage of Canadians watched than south of the border, where last year’s broadcast was seen by 114.4 million viewers. Of course, with 80 per cent of viewers using multiple devices marketers cannot be certain those numbers command the level of attention they once did, but the additional screens present a lucrative opportunity for those who know which audiences to target and how to reach them, Young wrote. 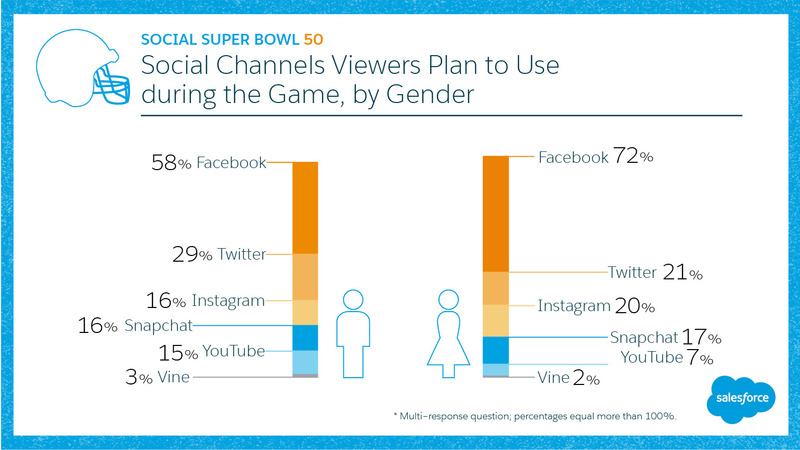 Most of the consumers that Salesforce surveyed said they plan to use social media during the game, to keep up with the action or chat with other viewers, though the specific channels they planned to used varied based on age, gender, and number of channels used. Among viewers who plan to use only one social channel, 48 per cent said they would use Facebook – a decline from last year when 66 per cent said they would use Facebook, Young noted – with 12 per cent of single-channel users choosing the next most-popular option, Twitter, and eight per cent saying they would be using YouTube. 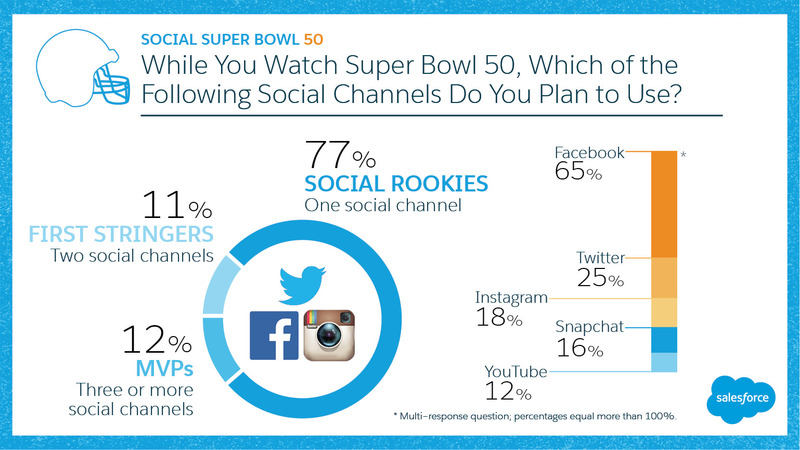 Dividing the numbers by age and gender added several other wrinkles – Facebook, for example, was far more popular with female Super Bowl viewers, who were then more or less equally likely to split their time between Twitter, Instagram, and Snapchat, while male viewers – more than half of whom still planned to use Facebook – were significantly more likely to choose Twitter as their second choice. 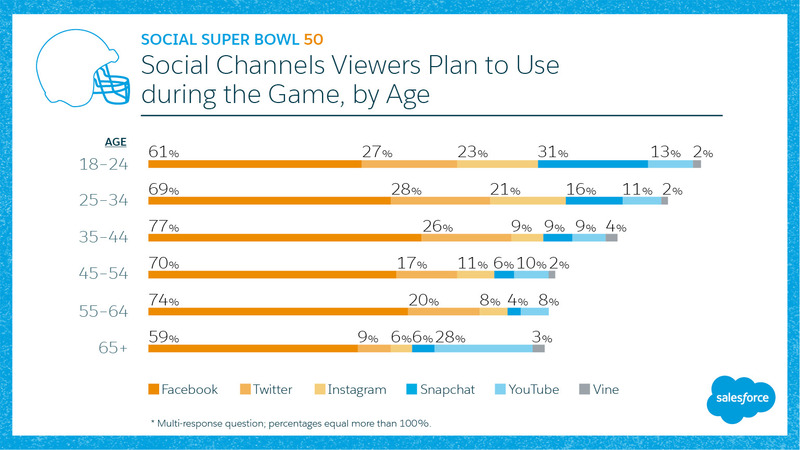 Dividing the audience by age yielded similar results, with Salesforce concluding that twice as many viewers between the ages of 18 and 24 were Snapchat users compared to viewers of all other age groups, and Instagram popular with a significant portion of viewers under the age of 34.